This kit contains everything you need to begin creating your new “smart” home. 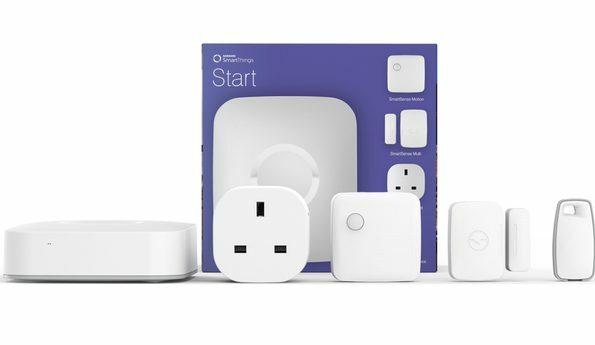 Turning your home into a smart home is easy with this SmartThings starter pack, you just set up the SmartThings Hub and free mobile app, add your choice of smart products, then take control of your home remotely. It’s simple to set up and once complete you can receive status updates and notifications about your home and control all smart devices within one single app. The SmartThings Hub is able to connect wirelessly with hundreds of compatible devices allowing you to control your home from the palm of your hand. The Hub wirelessly connects with up to a hundred or more compatible smart devices looking after lights, locks, thermostats, cameras and more – so you can monitor, control and secure your home from anywhere. The SmartThings Multi Sensor can monitor doors, windows or drawers to check if they have been left open as part of your home security system, plus you can set them up to monitor temperature and vibration as part of your home heating, ventilation and control systems. Unlike many other home automation systems, SmartThings is compatible with other brands, so if you buy their starter kit you’re not limited to just SmartThings products, you can still use the SmartThings starter kit to set up your smart home as the SmartThings Hub works with hundreds of compatible devices and sensors, plus the app is compatible with iOS, Android and Windows Phone 8.1 or newer mobile phones or tablet devices. With SmartThings Motion Sensors to monitor movement in your home, SmartThings Presence Sensor to know when people or pets arrive or leave, and the SmartThings Power Outlet to control lights, electronics and small appliances – once you connect all the devices to the hub you have everything covered!